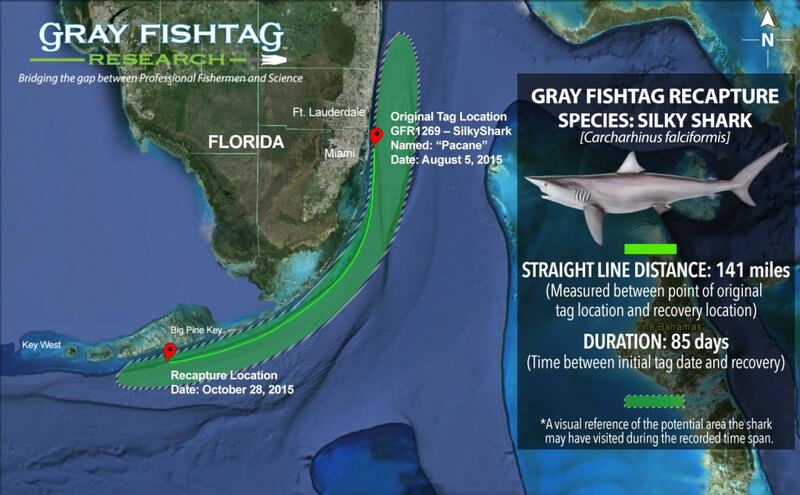 The Silky Shark (Carcharhinus falciformis) named “Pacane” (Tag ID: GFR1269) was originally tagged & released by angler Francois Dutnontier on August 5th, 2015 while fishing with Captain Mike Rodriquez and mate Chris Bostwick aboard the charter boat Therapy IV out of Haulover Marina/Inlet, Florida. The Silky Shark measured in at 108 inches total length and had an approximate weight of 325 pounds. The Silky Shark was recaptured on October 28th, 2015 by Captain Harlan Trammell while fishing from his charter boat American Allegiance out of Big Pine Key, Florida. Capt. Trammell is a charter operator with 35 years experience in the Lower Florida Keys. The Silky Shark was at liberty in the water for 85 days until its recapture near the Adolphus Busch Wreck, approximately 141 miles south of the original tagging location. During that 85 day time period, the shark most likely travelled south along the shelf edge or drop off, following water conditions that were ideal for feeding. At recapture, the shark had a total length measurement of 113 inches. Based on the length measurements at both tag deployment and recovery times, the silky shark is most likely 11-12 years of age. The Therapy IV (http://www.therapy4.com/) charter boat crew will receive some Gray FishTag gear for their tagging efforts. Captain Harlan Trammell (http://www.american-allegiance-charters.com/) receive a pair of Costa Del Mar sunglasses, a Tag & Recovery Certificate, and Gray FishTag gear for reporting the tag recovery. AFTCO, AA Video, American Fishing Wire, FECOP, Blackfin Rods, Mold Craft, Costa Del Mar, CR Primo Fishing Tackle, Shadow Graphics, Crocodile Bay Resort, Grande Alaska Lodge, Los Sueños Resort & Marina, Marina Pez Vela, The Pisces Group and The Zancudo Lodge.